Collard or sukumawiki as we know it in Kenya is in abundance at the moment because of the rains. At this time the kale is not too hard and is very green. I have come across a lot of kale salad recipes but before I tried them out I tried eating raw kale and I found it a bit too chewy. But I had to try a popular local vegetable with a bit of western ingredients. So, I tried out the following recipe and much to my delight and surprise, it turned out very tasty. But I must warn you, this dish is to be eaten with your fingers, as trying to use a fork, knife or a spoon is going to be a pretty tough task. Wash the collard leaves. Trim off the stalk completely. Tear each leaf into big pieces. Dry the leaf pieces on a cloth. Put the leaves in a bowl. Add olive oil and mix it well. Layer each leaf piece on a baking tray. Sprinkle the salt over it. Bake the leaves for 20 to 30 minutes till they are crispy. Halfway you will need to turn the leaves. When they are cool, store in an air tight container. To prepare the dressing, mix the dressing ingredients in a bowl. Add the finely chopped onions to it and let it marinate for 20 to 30 minutes. 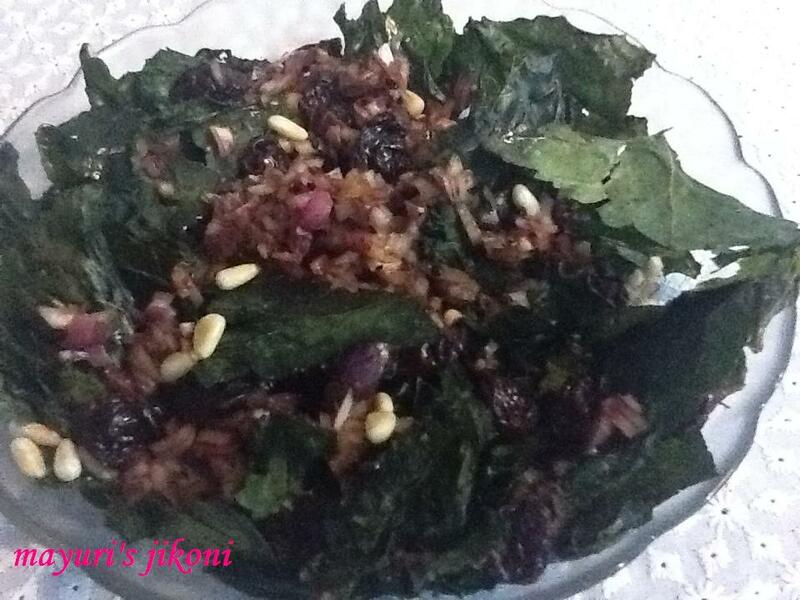 Before serving the salad, mix the crispy leaves, cranberries, pine nuts and sesame seeds gently in a bowl. Add the dressing on top and serve immediately. No need to add salt in the dressing as the leaves have salt on it and soy sauce is salty. Roast the pine nuts and sesame seeds separately in a frying pan over low heat. Can add raisins and cashew nuts instead of cranberries and pine nuts. The crispy leaves will stay for days in an airtight container. Can eat them on its own as a snack.